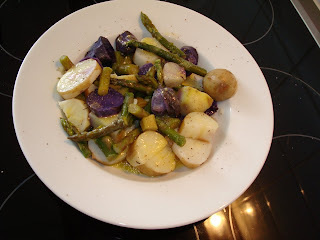 That looks awesome... it reminds me of a somewhat similar Barefoot Contessa recipe for potato salad (though that one has green beans vice asparagus). What a great idea! Me thinks you are too hard on white asparagus. But I love ya anyway! This looks delicious!!! 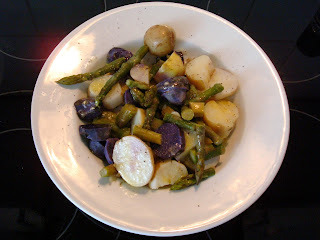 I've been craving asparagus lately and this recipe looks so easy I think I'm going to give it a go! Thanks! I am so all about easy... it absolutely is. And I ate it the next day too, adding the vinaigrette to that portion then. Oh dang...that does look fabulous :) Think I may have to make it this week!